◇=Japanese. つるとうさぎのりりのラブリー無料便箋（素材OK商用可）　☆=English. Crane and Rabbit riri. Free writing paper of the heart. ▼　◇ 洋封筒。　☆ Envelope. ▼　◇ A4用紙。　☆ Writing paper. 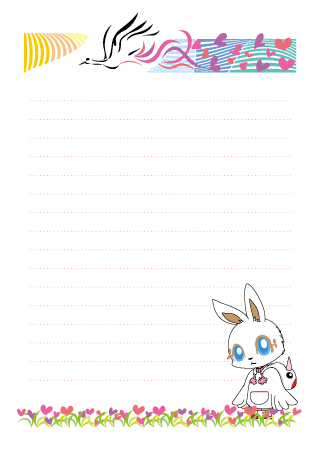 （＾v＾）I produced the memo pad of the rabbit riri. From my home page, you can print free of charge. In addition, My data can be opened in Illustrator mostly. Please feel free to use as material mascot. （＾∨＾）Processing and color change is also glad. ◇=Japanese. ニコニコオウムのこんにちわ無料便箋（素材OK商用可）　☆=English. A parrot to laugh at well. Free writing paper. ◇=Japanese. ポメラニアンのぽめぽめ　元気が1番笑ってね便箋（素材OK商用可）　☆=English. Free download Envelope paper Pomeranian. ◇=Japanese. 魔法使いのペンギン　まこちゃんの無料便箋（素材OK商用可）　☆=English. Penguin witch. Free writing paper of Maco-chan. ◇【Japanese.】 うさぎ無料便箋　のんびり笑顔のりりちゃん（無料素材 商用OK）*＊ ☆【English】. Rabbit Free letter paper. Leisurely smile of Riri-chan. （＝￣∨￣＝）Processing and color change is also glad. ◇Japanese. アルパカイメージ　花とルカの無料便箋（素材もOK商用可）　☆English. Image of Alpaca. Free Letter paper of Flowers and Luka. ◇Japanese. ダックスフンドイメージ　ラルの薔薇無料便箋（素材もOK商用可）　☆English. Image of Dachshund. Free Letter paper of the rose of Lal. ◇Japanese. 森のダンサー クアの無料便箋（素材OK 商用可）　☆English. Dancers of the forest. Free Letter paper of Kua. ▼　◇= 洋封筒。　☆= Envelope. ▼　◇= A4用紙。　☆= Writing paper. ◇Japanese. 猫様 エメラルドの無料便箋（素材もOK商用可）☆English. Cool Cat. Free download Letter paper of Emerald. （＾∨＾）Please feel free to use. ◇Japanese. パグ プイプイのにくきゅう無料犬の便箋（素材もOK） ☆English. Pug. 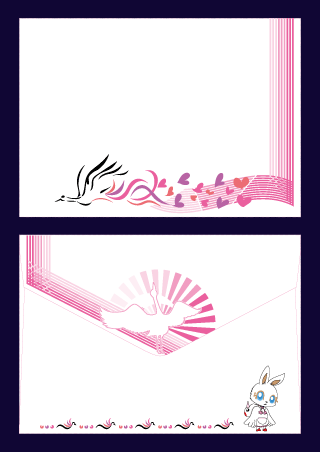 Free download Letter paper of the dog pad of Puipui. From my home page, you can print freely.